Our products are a great alternative to traditional rubber stamps. They are self contained, hassle free and eliminate the need for a messy stamp pad. The rubber stamp is inbuilt and replenishes itself after every stamp impression. What Self Inking Stamp should I use? Estamps recommend and supply the Austrian made Colop brand. Orders placed before 2:00pm are dispatched the same day. The Colop brand is synonymous with innovation and quality. Your stamp will be just like you design it. It’s easy and you can see exactly what you are getting. They can be used for both business or personal needs. How do I design a Stamp? 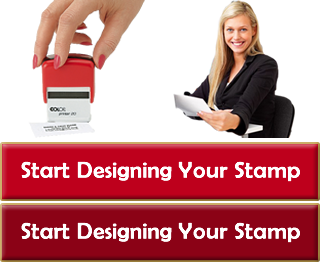 It is easy to design your own stamp with Estamps Australia. We have a “Stamp Designer” that allows you to enter your text and change the lettering style and size to suit. You will be able to see and print out a Proof before you order to make sure it is exactly what you want. When should I replace the ink pad? The ink pads are replaceable at any time and the wording can also be replaced if need be in the future. The Colop brand is a very economical choice as they have amazing longevity. They will give you approximately 10,000 impressions before re inking is required. Changing the ink pad is also very easy. Below is an example of some of the sizes of self inking stamps we produce through the Colop Range. Click image to go to our Stamp Wizard Creator! Do you have other rubber stamp products available? Please contact us if you have any inquiry concerning our products.